BioQuick News currently provides almost 1,000 searchable articles on major biological advances and has readers in over 160 countries around the world. The publication has also received numerous awards for publishing excellence and includes a Japanese edition. We would love to learn more about what you, our readers, think about BioQuick. What features do you like and what suggestions would you make for improvements? Please send your comments to BioQuick's editor & publisher Mike O'Neill at oneillmd@aya.yale.edu Please put BQ in the subject line of your message and include your name, degree, title/position/occupation, affiliation, location, and email address. We will not provide this information to any other source. We just wish to gain a better understanding of our readership and your interests. BioQuick is also interested in soliciting additional advertising and sponsorship, so please mention this if you are interested. Thank you very much for your support of BioQuick News. Dr. Qiang “Shawn” Chen, a researcher at Arizona State University’s Biodesign Institute and a professor in the College of Technology and Innovation has developed a new method of testing for West Nile virus (WNV), using plants to produce biological reagents for detection. While the United States has largely been spared the scourge of mosquito-borne diseases endemic to the developing world—including yellow fever, malaria, and dengue fever—mosquito-related illnesses in the US are on the rise. 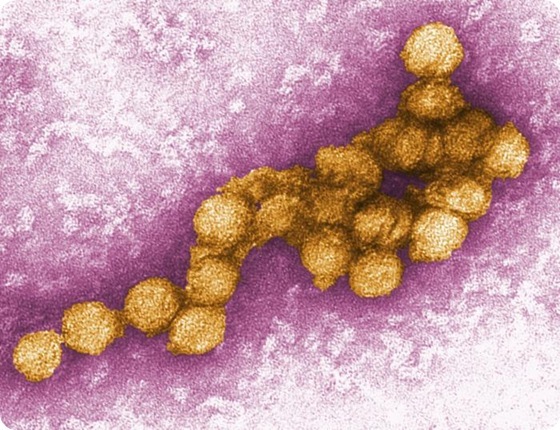 One pathogen of increasing concern in the U.S. is an arbovirus known as West Nile. The new research, conducted by Dr. Chen and his colleagues at the Center for Infectious Diseases and Vaccinology was published, in open-access full text, in the Journal of Biomedicine and Biotechnology. “One critical issue in WNV diagnosis concerns the difficulty of distinguishing WNV infection from other closely related diseases, such as St. Louis encephalitis and dengue fever, due to the cross-reactivity of antibodies among flaviviruses,” Dr. Chen says. “It is important to develop better diagnostic tools with enhanced accuracy for both treatment and diagnostic purposes.” Thus far, the 2012 outbreak of West Nile in the United States is on track to be one of the worst on record. According to the Center for Disease Control, 48 states have reported WNV infections in people, birds, or mosquitoes as of October 9th of this year. To date, 4,249 cases of WNV disease have been reported in humans, including 168 deaths. Of these cases 2,123 (50 percent) appeared in the more severe or neuroinvasive form of the disease, causing meningitis and encephalitis, while 2,126 cases were classified as non-neuroinvasive.